If you’re not one to take it easy on your cookware, then cast iron might just be for you. This near bomb-proof material will last for years and years with proper care. And what constitutes “proper care” may be easier than you think. Keep reading to find out more about these great pans and the companies that make them. 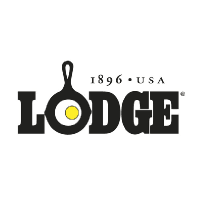 Lodge Manufacturing Company has been producing American made cast iron skillets, pans, griddles and more since it was founded in 1896 by Joseph Lodge. Located in the Appalachian town of South Pittsburg, Tennessee, the original foundry burned down and the company has since moved, modernized, and expanded. Lodge’s dedication to quality, technology, and employees have helped it not only survive but flourish. In 2002, pre-seasoned cookware was introduced, eliminating the hassle of its unseasoned counterparts. It was an industry first that has since become an industry standard. Cast Iron Skillets: A kitchen essential in any home, cast iron skillets are extremely durable and versatile, making them perfect for any cooking method from stove top to oven to grill. 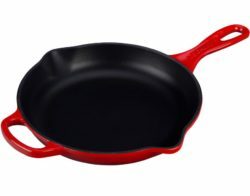 Round skillets are available in sizes ranging from 3.5″ up to 17″, and some sizes may be used with either tempered glass or cast iron lids (lids sold separately). Square skillets are available in 5″ and 10.5″ sizes. 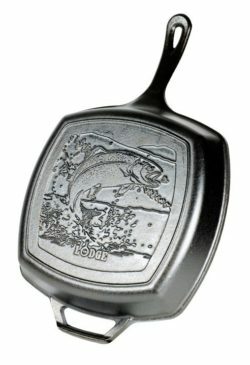 New to 2018, the all new line of wildlife themed cast iron cookware features some of America’s most distinctive animals. Cast Iron Griddles & Grills: Perfect for several cooking styles from traditional southern to ethnic cuisines. 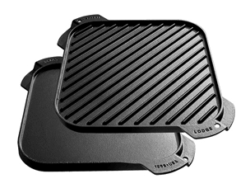 Lodge offers griddle and grill pans separately, as well as three reversible griddle/grill options. Griddles are ideal for cooking everything from bacon and eggs to pizza and pancakes. They conducts heat evenly with no hot spots and maintains heat efficiency and cooking control. The slightly raised edges keep oil, batter and other ingredients neatly contained. Griddle pans come in two sizes: 10.5″ round and 12″ square. Grill pans create tantalizing grill marks on meat or vegetables without having to leave the comforts of your kitchen. The raised bars will also let you keep food from simmering in fatty drippings for lower-fat cooking. Grill pans come in four sizes: 6.5″ and 10.25″ round, and 10.5″ and 12″ square. Cast Iron Dutch Ovens: The original slow cooker, cast iron Dutch ovens have been a kitchen staple in American homes for centuries and deliver superior cooking performance. Dutch ovens are perfect for cobblers and soufflés and can also make a great deep fryer. They conducts heat evenly with no hot spots and maintains heat for efficiency and cooking control. Available with wire a bail handle, perfect for camp and hearth cooking, or looped side-handles, making it easy to move from stove top to the oven. Sizes range from 1 to 9 quarts. 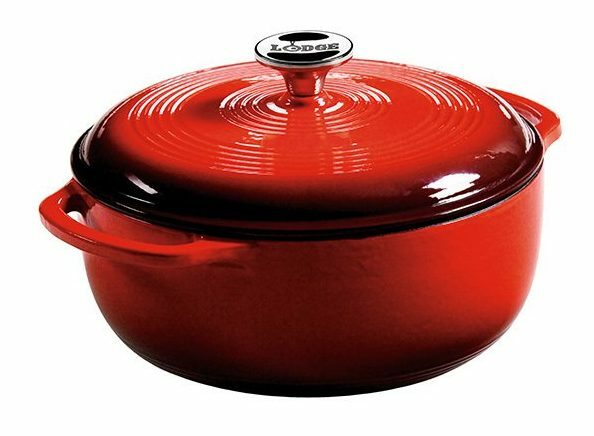 In 2005 Lodge introduced their colorful line of porcelain enameled round and oval Dutch ovens, available in sizes ranging from 1.5 to 7 quarts. These precise castings and tight-fitting lids absorb and retain heat extremely well. Clean up is a snap and you can marinate, cook, serve, and store food in these versatile vessels. Cast Iron Camp Ovens: The Lodge portable “camp stove” is the pot that does it all. The flanged lid holds hot coals and inverts for use as a griddle. The integral legs allow the oven to sit perfectly over hot coals. The bail handle is for use with a tripod when cooking over an open fire. Available in a variety of depths and sizes starting at an 8″ deep 2 quart oven, all the way up to a 14″ deep 10 quart oven. 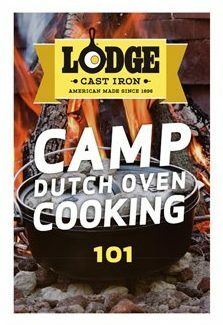 All camp ovens include the Lodge Camp Dutch Oven Cooking 101 cookbook so you can learn to use America’s oldest cooking implement, complete with illustrated guides and great recipes. Click here to find more great Camp Cooking recipes from Lodge. Accessories: Lodge has certainly thought through everything you might need to make cooking with cast iron as easy as possible. Whether you’re cooking indoor or out, their line of accessories covers everything from silicone handle covers, egg rings and specialty grill pan scrapers, to Dutch oven parchment paper liners, lid lifters and camp tripods. 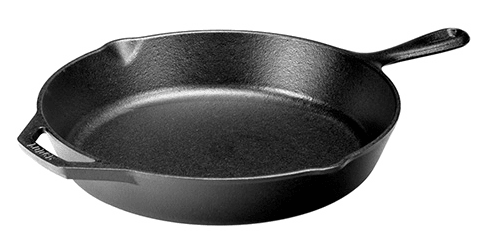 Use and Care: Lodge offers plenty of tips on how to get the most out of your cast iron. All of Lodge’s pan are pre-seasoned, meaning they have already had a layer of cooking oil baked on, and with a little TLC they can last a lifetime. Cooking tips: Cast iron can be used on all stove tops, from induction to electric to gas, even on the grill! Give your grill a few minutes to pre-heat prior to adding your food, and while you can always add oil; a low heat setting can prevent food from sticking. Because there is no chemical coating to damage you can use any utensils you like when cooking, even metal. Due to it’s awesome heat retention abilities it’s important to remember to use a hot handle mitt or pot holder when handling a recently heated cast iron pan. Cleaning tips: Cast iron should always be washed by hand. Use warm water and a bristle brush to scrub it. Add soap if desired but stay away from dishwashers and metal scouring pads, which can harm the seasoning of the pan. A pan scraper is great for removing stuck on bits or you can simmer a little water for a minute before removing the pan from the stove for extra sticky situations and then use the scraper after it has cooled enough to handle. Promptly and thoroughly dry your pan with a lint-free cloth or paper towel. You may notice some dark residue on your paper towel or cloth when cleaning. This is perfectly safe; it’s just the seasoning reacting to foods that may be slightly acidic or alkaline. It will disappear with regular use and care. After you have dried your pan and preferable while it is still warm from the wash, rub with a thin layer of cooking oil. This creates a layer of protection against moisture. Hang or store your cookware in a dry place until next time you’re ready to cook. Watch the video below to see the basics of cleaning your cast iron cookware or click here to learn more. 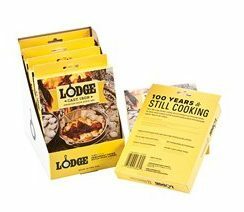 Lodge products can be found in the Housewares department at both Owenhouse locations. At the turn of the twentieth century, a new global perspective on cuisine began to dawn. Dining, once a private activity, went public, and suddenly people experienced the delight of sharing a delicious meal in the company of friends. And in the midst of all the culinary innovation and change, Le Creuset introduced the first vibrant, Flame-colored enameled cast iron cocotte in 1925. This ground-breaking cocotte took a kitchen staple – cast iron cookware – and refined it, making it more functional and more beautiful. Since that time, modern cuisine has continued to evolve and so has Le Creuset; growing to offer products across a range of materials and categories that guarantees every cook will have the right tool for the right job. Enameled Cast Iron Skillets: Indispensable in the kitchens of home cooks and professional chefs alike. Le Creuset produced the first enameled cast iron cookware nearly a century ago, and the original foundry still perates today, where 15 skilled artisans hand-inspect each piece. The interior surface of a Le Creuset skillet is finished with a matte black enamel that eliminates the need for the traditional seasoning and maintenance of raw cast iron. Specially formulated for high-surface temperature cooking, the enamel develops a natural patina over time that is ideal for searing, sauteing and frying. Available in sizes ranging from 6.3″ up to 11.75″ and in 15 unique colors. 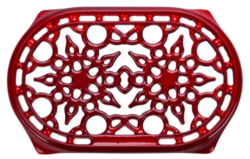 Enameled Cast Iron Braisers: Uniquely designed for maximum performance, transforming tough cuts of meat and hearty vegetables into tender, flavorful dishes. Food is first seared over high heat, then finished slowly in a flavorful liquid. The wide base of the braiser allows ingredients to be placed in a single layer for proper searing; once liquid is added, the domed lid continuously circulates steam to lock in moisture and flavor. The glass-like interior finish promotes caramelization, resists staining and prevents sticking to make cleanup easy. Available in 1.5 quart, 3.5 quart and 5 quart sizes, and 17 different colors. Enameled Cast Iron Dutch Ovens: Long recognized for its strength and durability, cast iron is the prime material for slow-cooking, braising and roasting, thanks to its ability to maintain even and consistent heat. 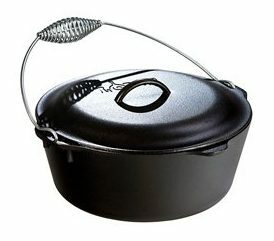 The enameled Dutch oven needs no seasoning, and it’s suitable for both stove top and oven use. 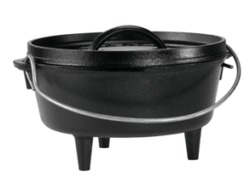 Available in both round and oval shapes of various sizes, these Dutch ovens also come in a wide variety of colors. The oval shape is particularly suited to longer cuts of meat or poultry. 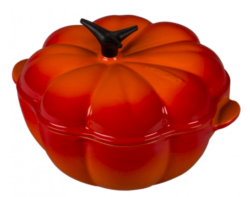 Seasonally themed Dutch oven designs are also released throughout the year. Some of these designs even become so popular Le Creuset chooses to keep producing them year-round. Accessories: Round out your Le Creuset collection with specially designed handle sleeves, trivets, and more. They even offer a wide variety of replacement knobs for their braisers and Dutch ovens if you find your’s is starting to look a little shabby. If you’re looking for more than cast iron accessories, Le Creuset also produces plenty of other cookware, bakeware, kitchen tools, and dinnerware for a well-rounded dining experience. 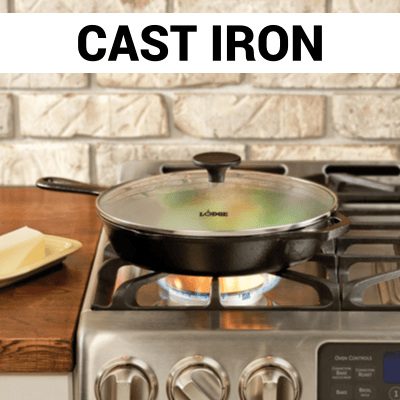 Use and Care: Enameled cast iron is a remarkable and robust material that performs well with modern requirements for food preparation and cooking. On the table, a hot covered dish will keep food hot for second servings. Cast iron can also be used to keep foods cold. A chilled dish becomes an ideal cold food server on a hot summer day. It can also be placed in the freezer for food storage or advanced food preparation. Cooking Tips: Cast iron performs well for either slow cooking or high-temperature searing, and can be used reliably on any heat source, including induction, and with any oven or grill. It has the ability to retain heat efficiently, which allows for use of lower heat settings in stove top and oven cooking. Medium or low heat will provide the best results for cooking, including frying and searing. Allow the pan to heat gradually and thoroughly for even and efficient cooking results. Once the pan is hot, almost all cooking can be continued on lower settings. High heat temperatures should only be used for boiling water for vegetables or pasta, or for reducing the consistency of stocks or sauces. High heats should never be used to preheat a pan before lowering the heat for cooking. Cast iron retains heat so efficiently that overheating will cause food to burn or stick. Due to the enamel lining silicone, heat-resistant plastic, and wooden tools are preferred. Metal tools, spoons or balloon whisks may be used, but require special care; they should not be scraped over the enamel surface. Do not knock these on the rim of the pan either. Hand-held electric or battery-operated beaters should not be used. Their blades will damage the enamel. Knives or utensils with sharp edges should not be used to cut foods inside a pan. Handles and knobs will become hot during stove top and oven use. Always use a dry thick cloth or oven mitts when lifting and never set a hot pan on an unprotected surface. Cleaning Tips: Always cool a hot pan for a few minutes before washing. Do not plunge a hot pan into cold water. 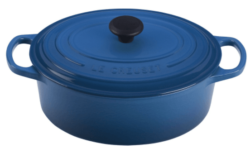 While Le Creuset’s enamel is designed to be the most durable on the market, thermal shock may still occur, resulting in cracking or loss of enamel. If there are food residues, fill the pan with warm water and let soak for 15 to 20 minutes before washing. A brush can be useful for removing small food deposits, or for cleaning between the ribs on grills. Do not use scourers or abrasive cleaners on the cooking surface. Nylon or soft abrasive pads or brushes can be used to remove stubborn residues. To avoid damaging the enamel, do not use metallic pads or harsh abrasive cleaning agents. Never store pans while they are still damp. Store pans in a dry cupboard or airy space away from steam. Maintain the tightness of all handles and knobs by checking and re-tightening them regularly. Le Creuset enameled cast iron is extremely durable but it may be damaged if accidentally dropped or knocked against a hard surface. Click here to learn more about caring for your enameled cast iron cookware. 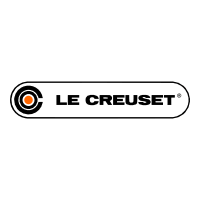 Le Creuset products can be found in the Housewares department at both Owenhouse locations.